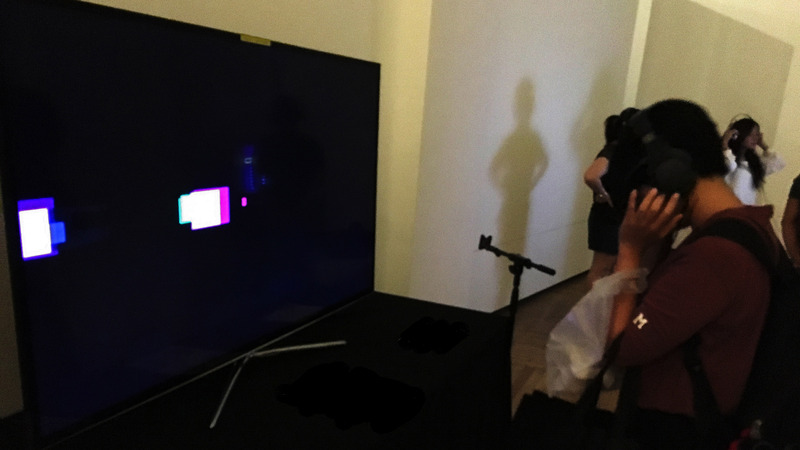 Equinode II, an interactive audiovisual work by James Dooley and Balandino Di Donato, was commissioned by SPECTRA Festival Malaysia in Kuala Lumpur (22nd-23rd October, 2016). Fusing audio, visuals and physical gesture to create playful artworks where the quality of the interaction is central to the user experience, the Equinode series examines novel interaction modalities where users experience interactive works that blur the boundary between the physical and the virtual. 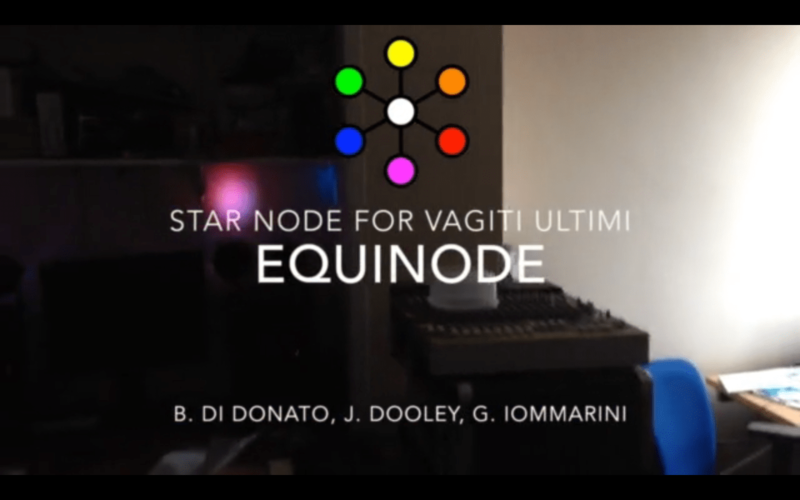 By presenting the audience with gesture driven audiovisuals, they are encourage to find points of balance and equilibrium, resulting in a gamified process to find an “equinode”. 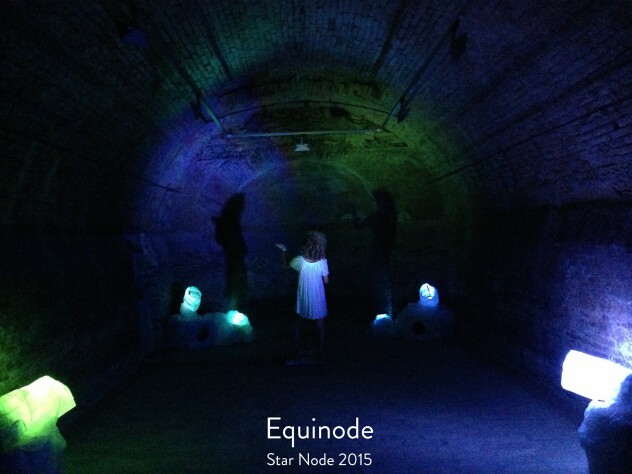 Equinode II features audiovisuals realised in the Pure Data/GEM programming environment. Utilising and juxtaposing elementary colours, shapes and sounds, a virtual world is presented to the user. Onscreen visuals are mapped to sounds, creating a sonic-object placed in a virtual space. Wearing headphones fitted with Ircam’s RioT board (http://ismm.ircam.fr/riot/), the user’s head movements are tracked, allowing them to navigate around the sonic-objects. By tiliting their head from left to right and backwards and forwads, the user is able to control the position of sounds in the headphones and their relative distance to the virtual objects on the screen. Controlled by an xOSC device (http://x-io.co.uk/x-osc/), LEDs placed behind the screen change colour in response to the onscreen visuals. The juxtaposition of visualisations and light projections creates an ‘aura’ that blurs the boundaries between the virtual and real world, presenting the user with an immersive, multi-sensory, game-like experience as they move around the objects. A particularly interesting outcome of the work centred around users’ expectations of how to control the system. When told that their head gestures manipulated the sounds and visuals, some particpants moved their whole body! Although subtle movements were all that were needed to explore the system, particpants often initially made exagerated gestures until later realising this was unneccessary. Demonstrating the process of finding an “equinode”, it also highlights how interactive works must be carefully presented to the user. As artists immersed in our own work, we must be careful to avoid imposing our preconceived ideas of how someone will interact with a system. Perhaps interaction design should be approached in a way that recognises the ways in which humans expect to interact with the world, then extrapolate these according to the way in which the technology extends our grasp of the world.